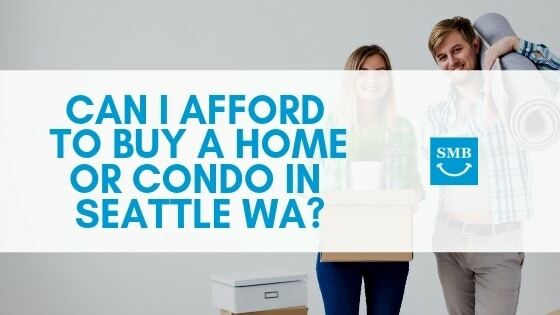 » Can I Afford To Buy A Home Or Condo In Seattle WA? Between record low mortgage interest rates, and falling home prices, it isn’t just an attractive time to buy a home, for many it might appear to be the last chance to buy a home in Washington’s top city. But just because the market is ripe for home buyers, doesn’t mean that everyone is ready to buy. Renting is getting more expensive in Seattle. It doesn’t matter whether you are in Spokane, Vancouver, or King County, renting is getting more expensive. But this is especially true in Seattle where rents have risen 20% in the last couple of years. Around a quarter of residents are already paying more than half of their salaries in rent. So perhaps a better question than “can I afford to buy a condo in Seattle?” might be “can I afford to keep renting if rental rates keep going up like this?” Or how about “can I afford to stay a renter at all?” Can I afford not to buy a home? How Much Does it Cost to Buy a Home or Condo? Of course there are cheaper homes to buy, and far more expensive ones too. There are additional costs that buyers should be prepared for too. Depending on the property there may be utility bills, property taxes, insurances, and condo association fees too. For those using an FHA loan and NHF Down Payment Grant combination the quick hack for estimating payments for mortgage principal and interest, taxes and insurance is to count on paying $700 for every $100,000 of house you buy. Am I Ready to Buy a Home or Condo? Maybe you are already paying $2,000 or over $3,000 in rent each month. So technically you could afford to handle the mortgage on a $200,000 or $300,000 home. But what about the moving costs and getting a home loan to buy that condo in Seattle, or a really nice home in Spokane? Is your income and employment stable? Is your credit up to par? Have you managed to put aside some savings? Can you afford the down payment and closing costs? Do you know how much it will cost to move? Can you qualify for a WA home loan? Maybe an old mortgage lender is still reporting, that you owe them, to credit bureaus when you discharged the debt in bankruptcy. Maybe it makes sense to stash a couple of months’ worth of bills aside just in case you have to switch jobs or get sick. If this is the case then make these very visible goals, and make a plan to get on top of them quickly. Can I Qualify for a Mortgage Loan? Most people don’t have an extra $100,000 or $300,000 laying around to pay cash for houses. So can you qualify for a loan? Most will find it much easier to get a mortgage today than it has been in almost 10 years. But you’ll still need a reasonable credit score and proof of income. But the only way to really know is to get pre-qualified to find out how much of a loan you can get, and how much house you can buy. What if I Can’t Afford the Home I Want? For many first time home buyers the challenge isn’t in being able to get a mortgage or affording the payments to buy a house. It is being able to get into their dream house, in their dream location. Or their spouse or significant other’s dream house. Who doesn’t want a magnificent estate, or waterfront penthouse condo? Very few people buy those as their first homes. Most people end up moving and upgrading every 3 to 5 years. Until they retire and downsize again. So don’t sweat it. A ‘starter home’ is just that. It’s a tool to escape renting and start building up equity to buy or build your dream home later. Don’t wait and sabotage getting your dream home because you want it all right now. Renting in Seattle WA isn’t cheap. And renting long term isn’t the way to live. Fortunately buying a home or condo in Seattle, Spokane, and Vancouver is getting easier. But it is not going to get any more affordable. If you can qualify get out there and get a home of your own. Use that home to level up to the one of your dreams in 3 years from now. If you can’t qualify yet, then make it a top goal to be ready by the end of the year.